Though I’m stuck in Chicago, Torontoans (is that a term?) have something to look forward to at the beginning of March. 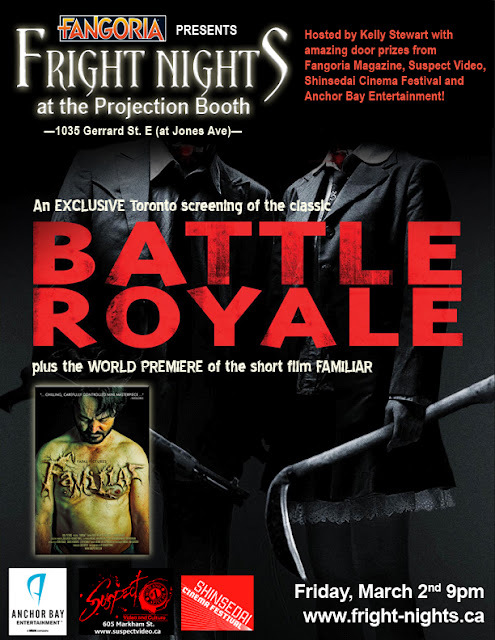 On Friday, March 2nd, 2012, FRIGHT NIGHTS AT THE PROJECTION BOOTH will present a rare theatrical showing of the director’s cut of BATTLE ROYALE along with the world premiere of the new short film FAMILIAR from Fatal Pictures. I reviewed FAMILIAR not too long ago here. Find out more about this very cool event here. Dread Central review of "FAMILIAR"